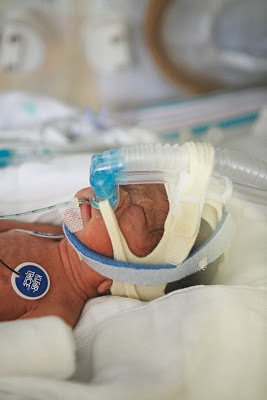 They warned us that preemies go through a honeymoon phase...they do really well the first week or 2 weeks of their life as they adjust to life outside the womb. Then they take a few steps backwards as their bodies start to tire a little. We're asking their lungs to breathe and work months earlier than they were meant to. They've lost their constant supply of nutrients and now their digestive system has to be awakened, slowly. We took some steps sidewards this past week but nothing that has worried us too much. Please, God, let that be the worse they ever see. Allie Astro: I mentioned the Apnea spells (forgetting to breathe), the Brady (heartrate dips) and desats (oxygen levels in blood getting too high or too low). She was having a few spells of all of them so they did some blood tests to rule out infection. Poor girls have blood tests every day (blood sugar levels and such). Astro's blood cells were normal which is great, but it showed that her hemotocrits (I have no idea how it spells) were low. We were told by NICU (the neonatal intensive care unit) before we even gave birth that both babies were expected to need blood transfusions. Their bone marrow isn't developed enough to produce enough blood cells to replace the naturally dying ones and the blood they lose through blood tests (however tiny amounts). So, Astro received her first blood transfusion (about 3 teaspoons worth). She was also had some dark stuff coming up out of the tube that takes air out of her stomach. For those two reasons, they had cut her feedings down to zero and she's slowly working her way back up. I asked what could be causing her desats/brady/apnea if it isn't infection and the nurse said "oh, I know what's causing it." Me "Oh, what?" The nurse "She's a preemie." They're not at all worried but they always want to double check everything to make sure it's not the beginning of an infection. Today, she's back to 2 mL every 3 hrs, and both babies move up 1 mL in feeding every 12 hours as long as they seem to be tolerating it. She is tolerating it and nothing is coming up out of her stomach tube. Hallelujah. 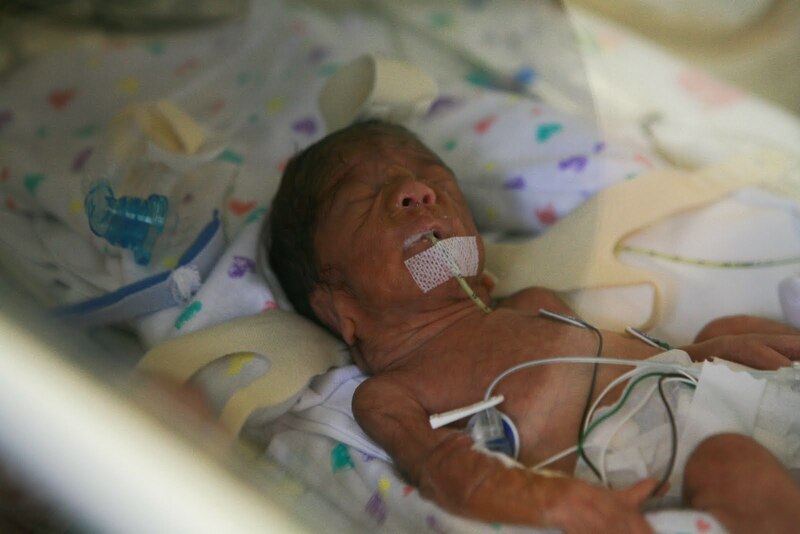 Astro is currently 1 lb 13 oz, she has reached and surpassed her birth weight. That's amazingly soon. Wooo hoo!!! Today, we ran out of time to kangaroo (see Scott's blog) so I didn't get to touch her too much. But, today, I did change her diaper and took her temperature. I hate taking her temperature. The metal probe is longer than her arm and she squirms angrily when you press it under her armpit. I think the blood transfusion revived her a little. We havent' heard her cry in a while. But we heard her express herself yesterday and today. And today, she opened an eye and looked around although I'm sure we're just blurs to her. But it was wonderful for me. Casey Slugger: Casey Slugger is at 2 lb 1.86 oz. She's still under her birth rate but she had dropped weight considerably so I'm so glad she's up in the 2 lb mark. After a rough start with feedings (they had taken her off because she wasn't digesting it), she's now a day ahead of her sister. Today, she is getting 4 mL of milk every three hours. We haven't seen her eyes open yet and she hasn't opened her eyes for us yet. But she loves sleeping and we love her sleeping. Conserve all those calories and build up that fat please, little girl. Mommy wants chubby babies. I have less to say about Slugger because she had a quieter week. And our rule of thumb for NICU is "we want boring." Boring is better. At first, Slugger wasn't having as much of a problem with apnea/brady but has picked up a little as she has gotten older and out of that honeymoon phase I mentioned. Both girls receive caffeine which is a little pick-me-up so today, they upped her caffeine to see if that helps with her Brady's. They'll up Astro's tomorrow. We talked to the doctor and she says she is really happy with their progress. It will be another four weeks probably before their apnea masks, the Si-Pap, comes off and before we get to try to feed them by bottle. Right now, they are fed by tube because they can't breathe and eat at the same time. 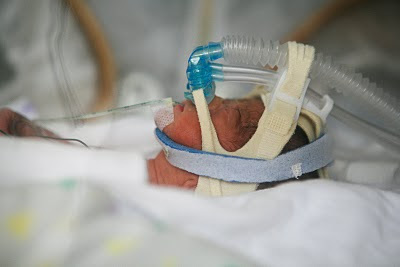 Scott got a quick glimpse of Casey when they replaced her apnea Si-PAP. Those are the hands of Casey's nurse, Janelle, to give you an idea of scale. And then you see the little wrinkly and squished face of Casey briefly. Me and Scott: I have to put this in but I need prayer as well. I think I initially was dealing well with everything...maybe adrenaline and the chaos of things got me along. Now, pregnancy hormones are kicking in and the pain and guilt I have over losing Rory is hitting and hitting hard. Scott's blog was beautiful but that picture of me holding Rory has such raw emotion, I can't get the image out of my head. When I'm trying to fall asleep after each pumping at night, I just see Rory's face and I just can't stop crying. I feel the sharp pain of missing her. I also feel the guilt of a parent who couldn't save their child. Friday night, I went to church trying to get back into normalcy. The minute I walked into worship, I backed into a corner and couldn't stop crying. Worship is such a huge connection for me and God, and now to feel that connection bring a painful awareness. God gets to be with my little girl and I don't. I know he loves her more than I ever could and is taking care of her, but I'm selfish. I want her with me. The loss feels huge in my heart. After church, I was just trying to hold it together and leave but we got stopped a few times as we walked to the car. I was completely rude to a woman who came up asking for an update, but I was trying to hold it together and I could feel myself failing. I think I was overtired. I think I wasn't quite ready to face the masses. And the babies had a few unstable days so we weren't able to kangaroo them so not only was I missing Rory, but I was missing all my daughters. I know how much people have adopted our girls and how much people care. We live for all the prayers that are covering our little girls. It just hits me harder some days than others. Yesterday we got to hold our girls and it was such a comfort. So, we feel a lot of better but it is a long struggle. We honestly are counting down the days until we can just hold and kiss our little girls. Keao, you are doing an amazing job. It's ok to cry, it's ok to lost it - it's natural. You will grieve. You will go through all of the emotions of losing someone because that is exactly what happened. But as I told you, she's with the best babysitter you could ever ask for. Take your time in grieving, there is no need to rush it. I still think back and have a cry sometimes when I miss the ones I lost. God is with you, he is walking side by side with you and will not let you go. The NICU experience is hard. You will have your ups and your downs. It's truly a roller coaster ride. But the good thing about it is that you will get off of this ride at some point. I promise. My babies were caffeine babies, we had all of the Apnea, DeSats and Brady spells as well and it will get better. 2 steps forward, 3 steps back - but you will make it. You are in my thoughts and prayers, all of you are. Don't hesitate to call me, any day and any time! God bless you, Keao. We're praying for your family. Sandi, it is priceless to have someone who understands and tells me that I am normal for feeling this way. So comforting and encouraging because I know that we are going to pull out of this. Day by day, it gets a little easier. Hi, Keao. I'm one of Scott's friends. Keao, I'm so sorry everything has been so difficult for the two of you and your girls. Your family is in my prayers. You are super brave for putting everything out there, but thank you for sharing so that we can keep up and see our prayers being fulfilled as Allison and Casey really begin to thrive. we are only human...that's why we need god and is perfect unconditional grace. 4 Weeks and a Birthday!! !